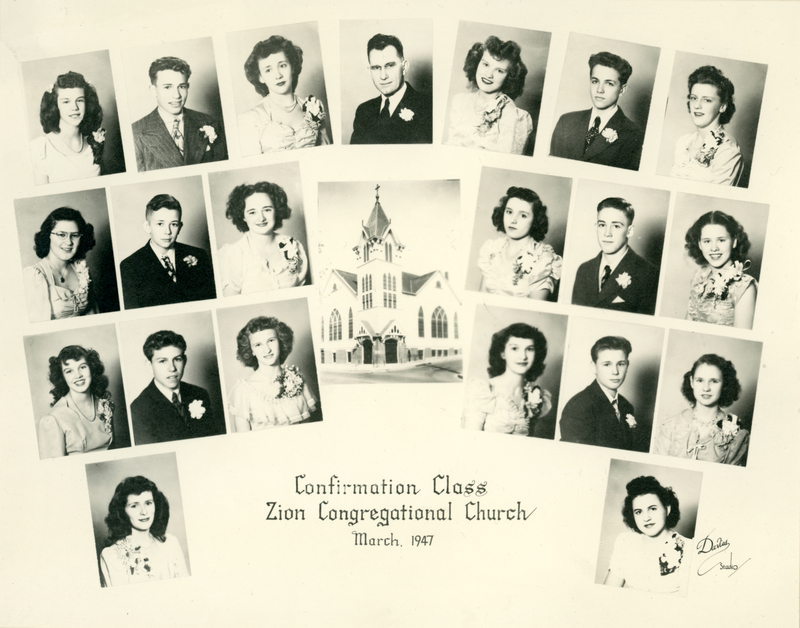 The Zion Congregational Church Confirmation Class of March 1947. Top row from left to right: Shirley Ann Litt, Walter Dan Klein, Marion Lydia Knippel, Rev. Theodore Strobel, ?, Dale Everett Brethauer, Elsie May Schleiger. Second row from left to right: Joyce Elaine Sinner, Alan Randall Tober, Eileen Jane Klaus, Mary Jane Weitzel, ?, Audrey Delight Miller. Third row from left to right: ?, Herbert William Margheim, Maureen Adele Reiter, Jonnabelle Schaffer, ?, ? Bottom row from left to right: ?, ? According to the Zion church records, the following unidentified people were members of the confirmation class: Leah Brill, Emma Mae Gates, Charles Russell Klein, Phyllis Jean Miller, Bonnie Jean Moor, Gloria Madeline Muth, Don Reuben Schwab. Photograph courtesy of The Center for Volga German Studies.